The club crest was commissioned and designed in the mid 1980s. The then Club Committee approached Eithne Bn. Ui Laoi to design a crest which would be fitting of and represent the local area. Eithne asked her son Tony, what he would associate with playing for the club and his answer was, “ The Oak Trees in St. Anne’s Park”. The finalised crest was presented to the club and great credit is due to Eithne for the splendid design which truly captures the essence of the club and our community. Club Colours: Maroon and white. Shield: A composite shield forms the main part of the crest which is divided into three sections consisting of an oak tree in the centre, crossed hurleys and sliotar on the left side and a football on the right. The Oak Tree is a common symbol of strength and endurance which represents the Adult sections of the club and the fruit from the Oak Tree ‘the Acorn’ which promotes growth and development representing the juvenile sections of the club. The presence of the crossed Hurley’s, Sliotar and Football representing our Gaelic Games. 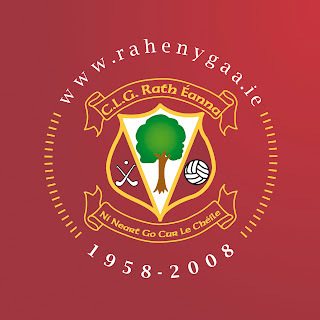 Hurling and football have been played in Raheny since the foundation of the club in 1958, with the addition of Camogie in 1983 and ladies football in 2003. The club motto: Ní neart go cur le-chéile at the bottom of the crest. The logo originated from a Celtic design Eithne painted for the club hallway. There was a lot of ‘Cur-le-chéile’ (working together), in the painting so Eithne decided on our motto of: ‘Ní neart go cur le-chéile’ (There is no strength without working together). Fr. Ryan one of our club founders bought the first set of maroon jerseys. Maroon, Fr.Ryan explained many years later for no better reason than that Galway, in their famous maroon, had just won the 1956 All-Ireland Final. Maroon and white are still our club colours to this day.